30 month time limit - The deadline for entering the National Phase is 30 months from the earliest priority date. Japanese translation - Although a foreign language application may be filed at the time of national phase entry, a Japanese translation is still required. The deadline to file a Japanese translation is 2 months after the date of national phase filing. 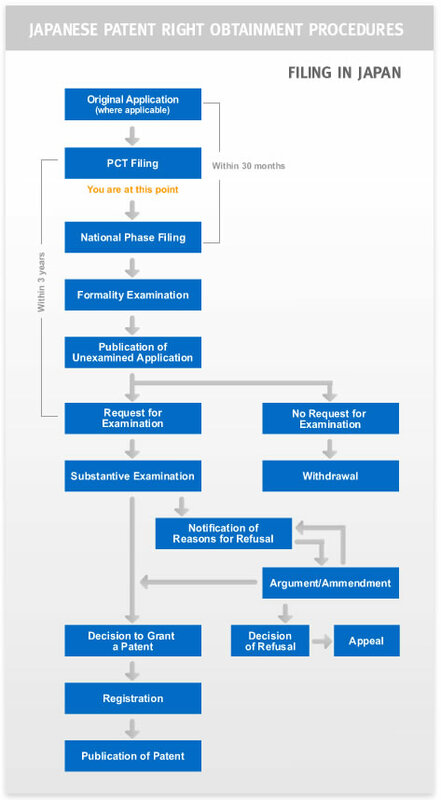 Substantive Examination deadline - The deadline for submitting a request for substantive examination for a patent is 3 years from the date of international filing. First-to-file system - Japan has adopted the first-to-file system, which means that if two parties apply to file a patent for the same invention, it is the first party to file that will be granted the patent. Therefore it's important to keep your idea secret until you file a patent. Application requirements - To enter the National Phase an application must be submitted to the Japanese Patent Office (JPO). A Substantive Examination is carried out by the JPO to decide whether a claimed invention should be patented or not. It will check whether the application fulfills the legal requirements and determine if there are any reasons for refusal. When is a Substantive Examination carried out? A Substantive Examination is only carried out by the JPO when requested by the applicant and involves an additional fee. If requested at the time of filing of the translation, the APA will waive any attorney fees (JPY 10,000). How can I make sure the JPO will approve my patent? Is it based on a technical idea that uses a law of nature? Does the idea have any industrial application? Did the idea exist before the current application was filed? Could the invention have been easily developed by a person skilled in this field? Was the applicant the first to file? Will the invention contravene public order and morality? Do the descriptions in the specification conform exactly to the requirements for patentability? Can I appeal a refusal? If the JPO determines after an examination that there are grounds for refusal you will be notified. You are entitled to submit either a written argument claiming that the invention differs from the prior art to which the Notification of Reasons for Refusal refers, or, alternatively, amend your patent to address the reasons for rejection. If no reasons for refusal are found, the JPO will grant the patent. When the patent fee has been paid, the invention will be added to the Patent Register and assigned a patent number. A certificate of patent will be sent to the applicant to acknowledge this formal registration. The patent will be published in the Patent Gazette, which is an online resource for researching existing applications.